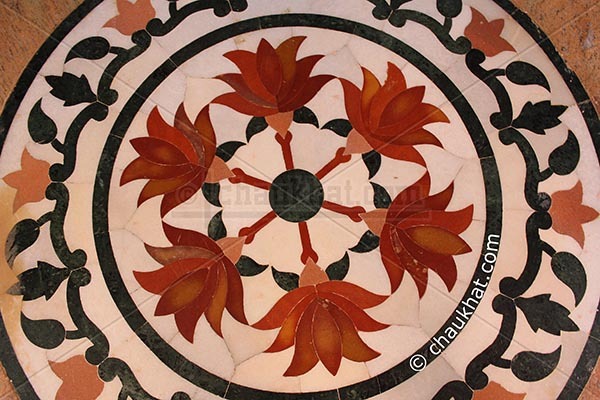 When I visited Prati Pandharpur, there was this work of marble mosaic medallions done on complete flooring. It was looking beautiful. What do you say looking at this photo? It is very difficult to create marble mosaic medallions. The artist must have knowledge of properties of marble & related material, some practical knowledge of architecture & engineering drawings, etc. apart from being creative. Usually even the smallest marble mosaic medallions take a lot of time. I have seen people work for weeks to create very basic marble mosaic medallions in my office building, for flooring. The one in the above photo must have taken… mmm… what do you say, how much time? The variation in the reds for the petals especially! It's beautiful and very intricate! It sure must take a lot of patience, creativity and hard work to create such pieces. @ Joy: Quite an art, really! @ Neha: You're right Neha! @ Miss Val's Creations: Really! Exquisite. Why don't write a comprehensive article on this. It will serve as a good exposure for many from outside India, I mean another aspect of the great culture. This seems too beautiful to put one's feet upon, doesn't it? I cannot even imagine the time it must take to create something like this. It does bring to mind your wonderful country, though, Bhavesh - its design and pattern. I can imagine it, in beautiful stones as a lovely piece of jewelry - a necklace or earrings, perhaps. Very fantastic marble paintings. Thanks for sharing with us. Please keep it up. @ Rameshwar: Thank you! Sure! !